Social Media Manager with over 6 years of experience. Skilled in developing strategies to carefully coordinate campaigns for optimal reach and engagement. With an excellent eye for design and extensive experience in web design, photography, videography and content writing. I bring a lot of natural enthusiasm into my work and I am driven by passion, which comes across in my creativity. Your business is unique and that requires something or someone unique to mirror what you want to project to the world and your audience. Hiring me is the solution. I have provided my expertise in several sectors, including automotive, recruitment, legal, travel, education, food & drink, health & wellbeing, retail, finance, e-commerce, beauty, real estate and construction. Managed all of the agency’s B2C and B2B clients’ social media accounts. – Visual and written content creation, social strategies (inc. contests and giveaways), organic and paid social, scheduling (Hootsuite, Sprout Social) and community management. – Videography, blogging, newsletters and Bravr’s website maintenance. – Supported new business development, contributed to proposals and participated in social media strategy/campaign pitches. 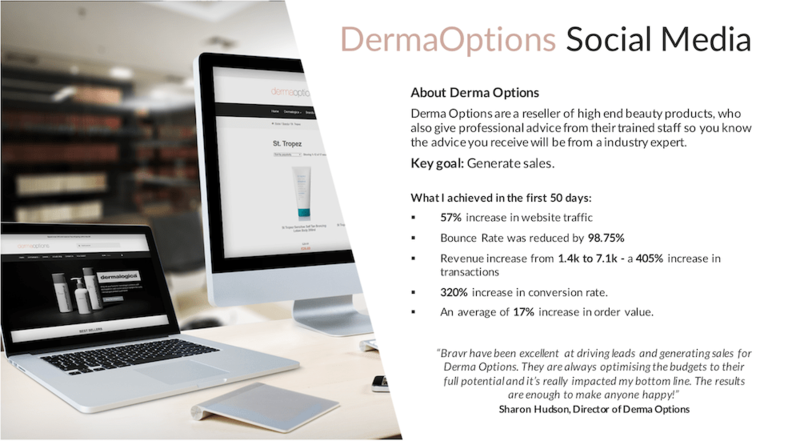 – Achieved up to 19k% increase in followers, 57% increase in website traffic, 99% reduce in bounce rate and 405% increase in transactions. – Increased engagement by up to 1k% – 12k Likes and 7M impressions on a single post. – Finalist in the 2018 Royal Greenwich Business Awards for “Digital Leadership”. Responsible for all the brand’s global social pages, creatives and strategies. 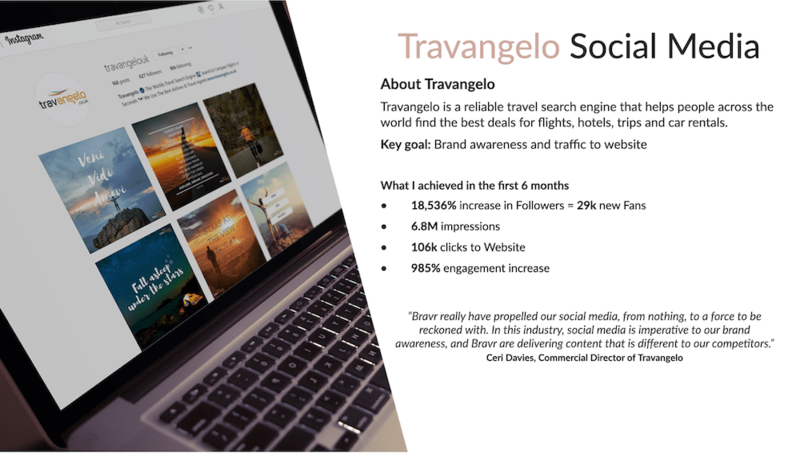 – Created an effective on-going social strategy for Prospero’s 3 main branches (teaching, health and social care and AV recruitment), across 4 countries. – Highly involved in videography, content and SEO. – Trained the Marketing Assistant to effectively use blogging, SEO and social media to grow the company. – In 3 months: doubled the organic followers count on Facebook to 12k. Extensive experience managing professional social media accounts and modern WordPress websites. Specialise in B2C and start-ups. High client retention rate of up to 5 years. 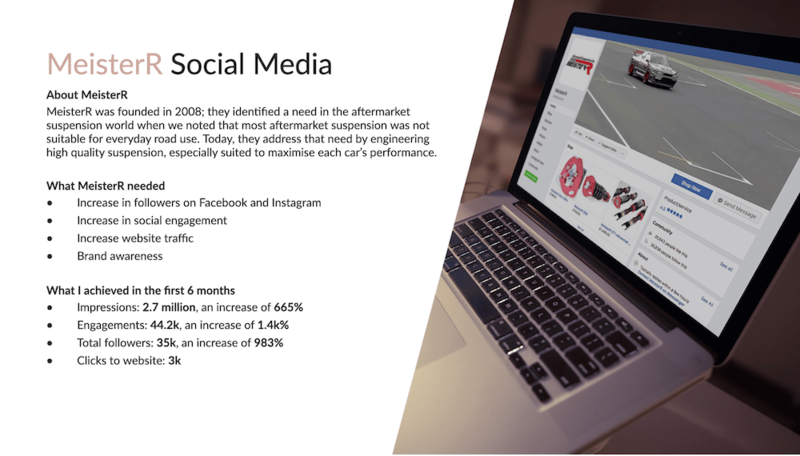 – Increased social engagement, inbound website traffic and sales through development of content, application of analytics tools and brand awareness strategies. – Managed online communications via digital channels to increase brand reputation and SEO. Specialise in food, travel, property and underwater photography. Filmed and edited promotional videos, online courses and documentaries worldwide, since 2016. Editing is done using Lightroom, Photoshop and Final Cut Pro X. Please see my rates here. Create content, ghost blogs, e-books and publish monthly articles for various online magazine sand brands, such as the Raw Food Magazine and La Chispa Magazine. Also an author of a 330-page book on healthy living, with recipes. Excellent grammar, attention to detail and editing skills. Fluent in iBooks Author. Organised events, workshops, retreats and trade exhibitions for realtors, professional personal development coaches, health instructors, wellbeing consultants and artists. Largest event organised was for 350 people. Responsible for all research required on the state of the mobile advertising industry, competitor analysis and creation of informative presentations for potential clients. Used ComScore and other statistical resources to create detailed visuals on mobile areas of interest. If you’re looking to build a dynamic and engaging website, then you’ve come to the right place! I provide this service worldwide, so wherever you are, we can make your vision come to life and give you the best online presence you deserve! This website you’re looking at right now! It’s important for me to know your business and vision inside out so I can create the best design possible. I will leave no stone unturned when collecting information to start the process. I will create a stylish and modern website for you using WordPress. It will be fully optimized for desktop and mobile devices with a responsive theme and retina display compatible graphics. Once the website is live I can teach you how to use the backend as well as provide on-going services such as SEO, Google Analytics, monthly reports and general regular maintenance. Want to build a great website or grow your business with social media? Get in touch today!